'...As soon as they left the synagogue, they entered the house of Simon and Andrew, with James and John. Now Simon’s mother-in-law was in bed with a fever, and they told him about her at once. He came and took her by the hand and lifted her up. 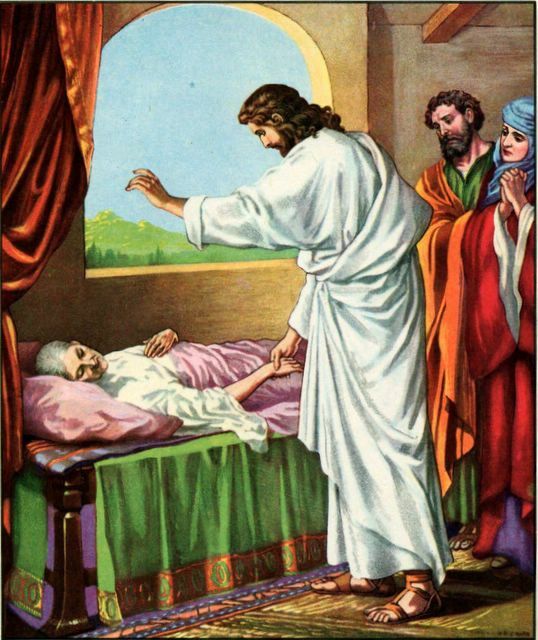 Then the fever left her, and she began to serve them. 1. The exhausting, full-on nature of Jesus' ministry. There is no let up. But what do youthink? Post any comments or reflections below. I see what you mean about the oblique reference to worship James with the word diakonei, but is that reading too much into the passage? Is there something about the restoration of God's order in the universe, through this healing, through traditional understandings of Jewish headship that we find difficult and politically unsavoury today? Also, we all too often ahve a reductionist view of healing in the church, and place it only into the realm of the NHS! I am intending to link the Gospel passage with the Isaiah reading 'those who wait on the Lord shall renew their strength' to encourage to congregation to think about how they renew their strength for mission and ministry. Jesus went off quietly to pray to renew his strength. Even he couldn't keep going forever without renewal. Mere presence of Jesus renewed strength of Peter's m-in-law. For us, worship should do so (sometimes does, sometimes doesn't). Especially Communion. Also regular prayer. Reading and study of Bible. Can't be always giving - need some way of feeding on God. Jesus recognised that he need to spend time in prayer and that if people saw him up they would want a piece of him. So He took time when he knew he wouldn't be disturbed. Even at a cost to his own strength. It being so early. Yet he did it. When have I taken that space in my own life? He didn't say no I must stay here. People want me. He moved on so more people would hear his message. How many times do we as people and church get fixated on 1group/people/estate. With our buildings, structures, policies. Jesus was light with what he carried. The shirt on his back. So he was able to respond immediately. Turning a church can be like turning a cruise ship. It takes 10miles to stop once the engins have been turned off! Finally, I promise, I love that Simon "hunted" for him. That one word stands out more than any other. Do I hunt for Jesus in my life? Or simply walk and hope he's there. The thing that always stands out to me from this passage is that Jesus longed for some quiet time alone with His Father. It must have been so hard for Him to find that time, and the statement "in the morning, while it was STILL VERY DARK" says it all, he must have barely slept. I can almost imagine Him lying awake waiting for the others to fall asleep so that he could get out by Himself. In a world that keeps striving after 'me time', this really speaks to me about the massive importance of 'God time' - Jesus didn't want to get some time alone to chill, he needed time alone to be in closer fellowship with God.